When most divers think of wrecks, places like Truk Lagoon and wrecks like Egypt’s Thistlegorm spring to mind. Unfortunately for those who have visited, these memories can sometimes be clouded by bubbles from too many other divers also getting wrecked. This is why I chose to get my metal fix in Coron. “Where ..?” I hear you ask – my point exactly! Coron is the main port of a tiny eastern Filipino Island called Busuanga. During WWII this dusty island and its immediate locale was occupied by Japanese invaders. On 24th Sept 1944 some 120 Hellcat fighters and Helldiver bombers took flight on a mission to destroy Japanese targets in the Philippines. Travelling 350 miles to reach their target, the strike was to be the most distant at that point of history, yet 45 minutes after reaching Coron Town the 15-18 Japanese vessels at anchor there were left behind burning, exploding and sinking. I flew to Busuanga from Manila on a 19 seat Sea Air twin propeller plane. The views were breathtaking and the ambience certainly heralded the adventure to come. Propeller planes have very particular weight regulations; both you and your luggage will be weighed and charged accordingly. If you travel with lots of dive gear and photographic equipment it’s sometimes cheaper and less hassle to book an extra seat for your party’s luggage. If this sounds like you then be sure to remember that you are purchasing the luggage weight allowance and the human weight allowance for that seat. Daily flights operate and the journey is just a short hour hop from Manila. Buses were ready to meet each plane for the dusty and bumpy journey to Coron Town. Overnight ferries operate between Manila and Busuanga. These take longer, around 16 hours, but aren’t so strictly observant of weight allowances. 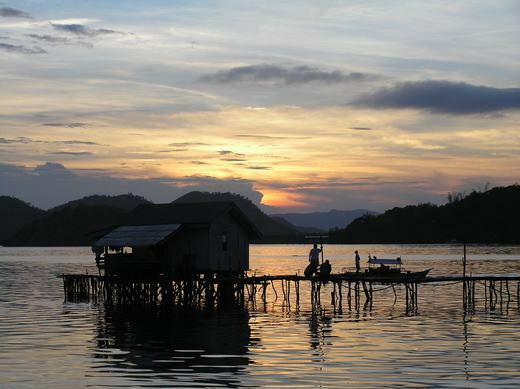 The ferry terminal is just 2 minutes away from the resort in Coron Town itself. Accomodation ranges from seats to dorm rooms, shared cabins and private cabins. If you like your privacy and a good night’s sleep then book a cabin to share with your group or pay the extra for your own cabin – it’s worth it. 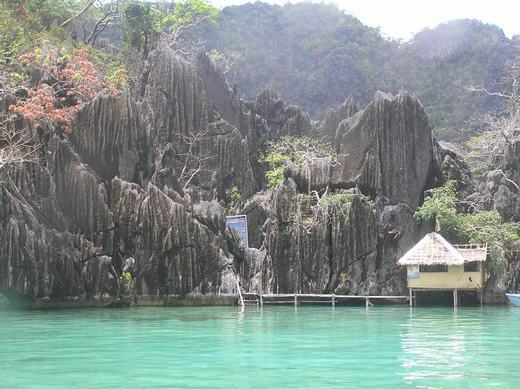 There are a number of dive centres in Coron itself and a few more dotted on neighbouring islands. I chose one of the busier dive centres, Sea Dive Resort, as it is a technical dive centre, offers nitrox, has a great on-the-road reputation and is always going to have enough divers to ensure that a wreck trip leaves everyday. Sea Dive has a great waterfront location which is reached by a snakes-and-ladders route of alleys and bridges from the main road. The resort houses the dive centre, bar, sun deck, restaurant and rooms. Rooms range in size and most offer nice seaward views with a choice between fan and aircon. Outside of being on one of the nearby islands in a resort, they are probably the best you will find for the price. The resort is busy, so do book in advance. Built for divers, you can literally step away from breakfast to the deck of your boat and upon return you’ll have a cold beer in your hand whilst the crew are still securing the mooring lines. Internet is available and free wireless is easily accessible in the restaurant. The food is great solid fare and the best I ate in the Philippines – ideal after a hard day’s diving. The staff are friendly and helpful, get talking and you will hear tales of lost ships and planes. A Hellcat propeller decorates the bar wall and it seems the prize was so great that the salvager was killed for his plunder and with him died the Hellcat’s location. With vessels and planes still to be found, speculation is easy to stir and a great way to pass the time while enjoying a few beers. Fish spotters and coral fiends beware – this is not the place for you. Metal heads however will be wallowing like the proverbial pig-in-a-poo-pile. Of the 14 wrecks that have been found, I visited 7 and repeated 2 due to their size. I took a day to de-magnetise and visit the thermal lake and a local reef too. Destinations are flexible, with often a choice of two trips, so you can be reasonably assured you’ll get to see the wrecks you want. The wrecks can easily be enjoyed by recreational divers but an advanced certification is recommended and can be taken during your visit and a nitrox licence will certainly lengthen your fun. Technical courses are offered all over the Philippines and in 2 centres in Coron and while it’s not necessary to enjoy the wrecks, if you’re certified, bring proof. I dived all the wrecks on a single air tank in a recreational set up but took a sling tank of 50% EANx and undertook either accelerated decompression dives or mulit-level profiles extended by the richer gas. For me this was great as it meant I got a guide all to myself and could be very flexible with my dive plan. So if you are qualified to do this kind of diving it easier and cheaper than a full tech set-up. If not – don’t worry: by far the norm was air or recreational nitrox! The dive boats are based on the traditional Filipino banka but are larger and have a second deck. The day was unhurried and relaxed, long surface intervals and lazy days. Lunch was served on the boat and the crew cooked up a mean feast of freshly caught fish and local dishes, plenty of choice and enough to satisfy the most voracious appetite. We were even treated to fresh seaweed picked from the mast of the wreck we’d just visited, a lovely, tasty addition. The cooler was stocked with a mix of fizzy drinks and water and a few cold beers for the return journey. The wrecks themselves are stripped clean and clear, you will not be artifact hunting but you will enjoy relatively tangle free wreck penetrations. The swim throughs and metal seascapes are stunning and your dive boat is likely to be the only one at any given site. 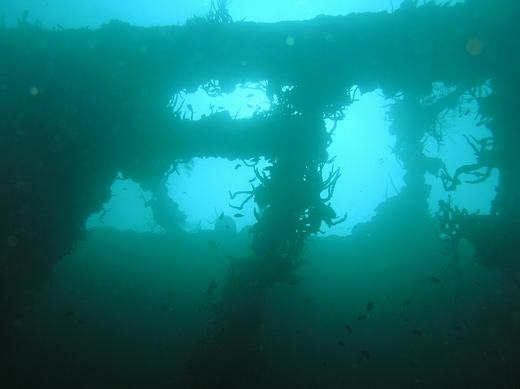 Ask your guide and you may even get the opportunity to swim through a propeller shaft and pop out the stern – great fun ! 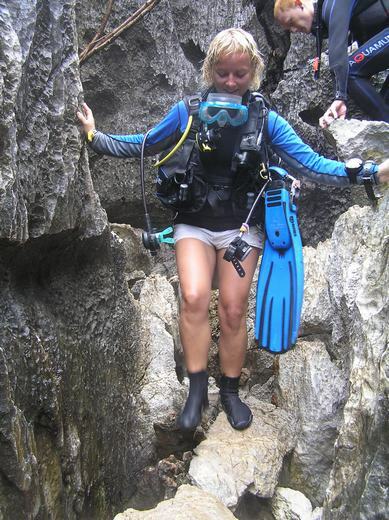 A very experienced guide will really make the difference to your diving. I’m an experienced diver and love wrecks but I was happy to have a guide. He’d dived these wrecks for years and easily led me in, out, through and around, pointing out all points of interest and much that even the most experienced diver would have missed on their first tour around the wreck. The wrecks have become makeshift reefs and home for much sealife and you will see barracuda, hundreds of jacks, bat fish, puffer fish, grouper and the wreck loving scorpion and lion fish. The Irako has to be the largest wreck, locally called “the monster”. She is also one of the deepest, sitting upright in 42m of water. I dived her twice, once to see the outside and once to see the inside – she really is that big. Divers are split into groups based on their experience. The full penetration is not for the faint-hearted but is awesome. 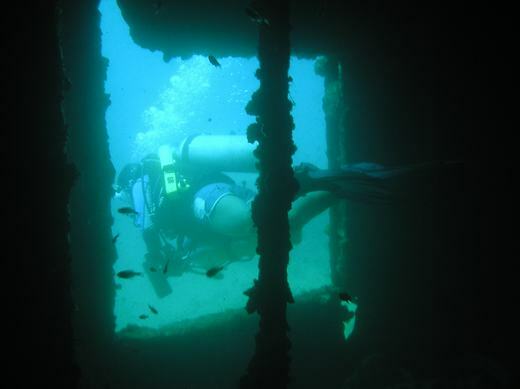 I spent my dive swimming through multiple decks eerily lit by shafts of ethereal light penetrating the hulls fissures or streaming through portholes. The interior is quite silty so perfect buoyancy and careful fin kicks are needed to ensure those behind you can enjoy too. The Akitsushima is a wreck I will always remember for re-enforcing the perils of wreck penetration. She sits on her side and the diver is treated to spectacular cathedral like views. A well lead tour will take you around the engine room and point out many interesting features. The main part of the penetration here is easy wide uncluttered decks,lying on her side the spaces are wide. The more experienced you are the tighter spots you will found yourself being led into. Most people have ended up the wrong side of a jammed toilet door on dry land, but not many have been unable to find their way out of the toilet due to a silt-out 18m below the surface. I was third in the group when the visibility dropped to near zero because the diver infront mistook the wrong gap for the exit, hit the wreck causing silt to rain down. My heart rate went up but I had been memorising the reverse path to each exit we passed. Just as I was wriggling backwards the guide’s hand lifted my first stage clear. No harm done but lesson learnt! 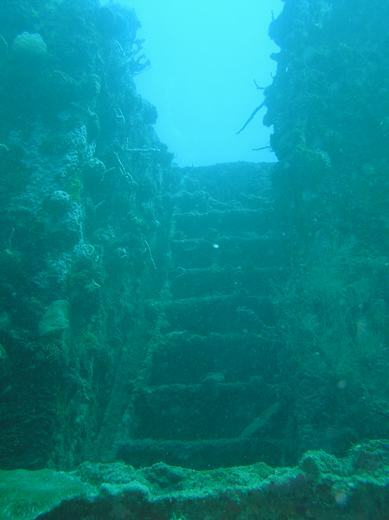 The Kyukuzan lies upright in waters off the North East coast of Busuanga and was easier to access overland. The journey seemed endless and was certainly not as comfortable as lazing around on deck but it was worth the trip. Swarming with fish and home to the aforementioned seaweed salad the cargo rooms hold such delights as car and trucks. The large wreck certainly merited two dives! The Olympia, Taiei Kyogo Marus are simple wreck dives, easily enjoyed with large airy cargo areas and lovely swim throughs, swarming with fish and some great coral. On the Kyogo you can see a bulldozer in her holds. For something a little different the thermal lake is quite an adventure. A winding rough wooden stairway cuts a path up, over and down to the lakes edge which, like a military assault course you will complete fully kitted up. The lakes surface temperature is normal but the deeper you go, the hotter it gets until its too hot to bear. The thermoclines are clearly visible and very distinct but once you disturb them will blur into a milky cloud. Some small fish inhabit the lake and shrimps will come out of the rock crevices to clean your fingers. The day was coupled with a reef dive, I did see an eagle ray but otherwise I was quite disappointed. 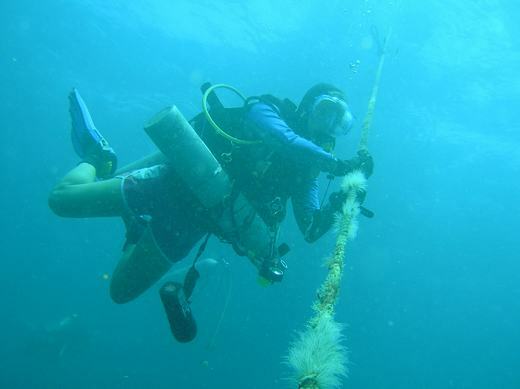 If you’ve come to dive the wrecks of Coron – then do just that! Diving is year round with water temperatures ranging from 27-31c. Rainy season is July to October and the hottest weather December to May, in between times the weather can be changeable but due to the sheltered nature of the dive sites, boats rarely get cancelled. Visibility can be a bit hit and miss and you probably won’t be treated to 20m plus aqua marine, but visibility was certainly good enough for wreck exploration. Overall I loved my time in Coron, for me it was the best part of the Philippines and I would highly recommend it for avid wreck divers. Start Planning Your Philippines Dive Trip Now! :: Check the availability and pricing of liveaboards in the Philippines and book online. :: Find the cheapest flights to the Philippines with Skyscanner - one search will show you the prices and times from scores of airlines for your trip. A real timesaver. If you need a good transit hotel near Manila airport, try the Marriott or Nichols Hotel. The actual Manila Airport Hotel is very run down and not recommended. :: Get dive and travel insurance for the Philippines from World Nomads - make sure you're covered above and below the water. World Nomads lets you buy insurance online quickly and easily. :: Find available places to stay in the Philippines on Booking.com - usually you can reserve a room with no upfront payment. Pay when you check out. Free cancellations too. :: Need inspiration? See our Best Places To Dive In The Philippines for ideas of where to go and what to do.